I decided to use a NYX polish for this week’s Throwback Thursday in honor of last week’s Pluto flyby. Yeah, I stretched it a bit, but frankly, I didn’t have any nail polish named after Pluto (the Greek god of the underworld, the dwarf planet, or the Disney dog!). So I figured the next best thing was to go with a brand named for the Greek goddess of darkness and night, since that is also the name of one of Pluto’s moons. Well, I wish they’d bring their nail polish back, because it was pretty nice for the low price! Ironically, for a brand named after the goddess of night, the polish is called Sunshine! It is one of just a couple of NYX polishes I have—I regret not having bought more when they were available—and it’s one I really like. It’s sheerish and a bit frosty, which would normally have it get off on the wrong foot with me. But! It’s a light pinked peach that’s loaded with iridescent golden green shimmer. Aw yeah! It is very reminiscent of the inside of a seashell. Despite its sheerness, it’s actually quite opaque with two coats. The formula is still excellent, smooth, and not unbearably streaky for a frost. I actually think it isn’t quite sheer enough to work as an iridescent topper, which is perhaps its only minorly disappointing feature. 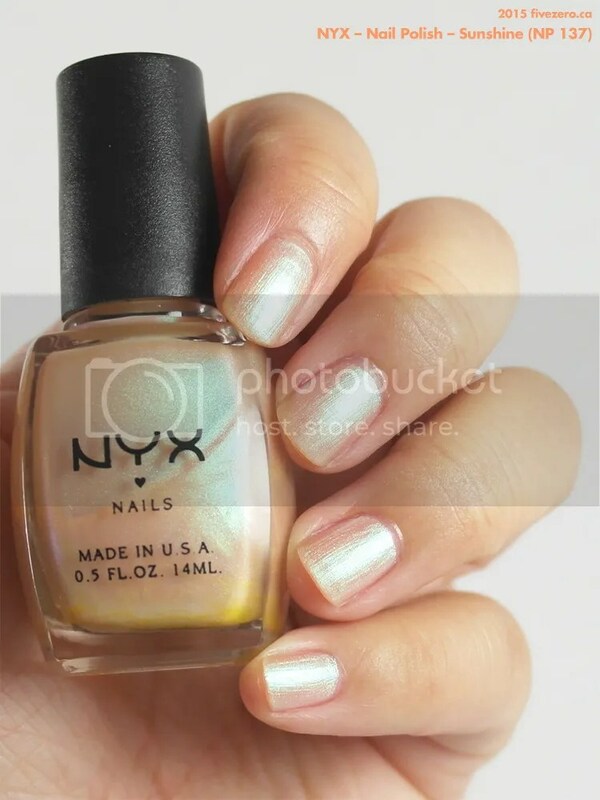 This particular line of NYX Nail Polish was fairly inexpensive (perhaps around US$3?) and was 0.5 US fl oz / 14 mL. It is free of toluene, formaldehyde, formaldehyde resin, and camphor. However, it does contain dibutyl phthalate (DBP). NYX Cosmetics (named after the Greek goddess and pronounced “Nix”) is based in Los Angeles, CA, USA. It has been owned by The L’Oréal Group since 2014. NYX also states that they are cruelty-free, but I’m not sure how that jives with being part of L’Oréal. Oooh I like this one. I have a few NYX polishes – I wasn’t too wow’d by the shades I got but they’re nice for the price. This colour reminds me a bit of Essie Anniversary Gala (which is more pink and not really frosty as much as sheeny) – I think this shade would look lovely layered over something. Yes, it’s a little like Essie AG, for sure, in terms of the awesome iridescence. This is definitely frostier, yet it somehow just works. Haha, yeah, they don’t make a big deal out of it. I don’t know why. I imagine they could make a killing if they put some effort into it! Did you just say 7 – 8 years?? It’s like you had just bought it yesterday! The texture of the color is still smooth. You girl really know how to keep them in mint condition. Pearls on your nails, I love iridescent! Yes, I agree! Usually sheer duochromes are pink/purple and green, which gets a little boring. The side of a seashell is the absolute perfect way to describe it! So pretty! I love how bright and iridescent it is! I’ve never tried NYX nail polish – too bad it is only sold in sets now!! Yes, I really wish they’d do a proper nail polish line like they used to! They even had a NYX Girls line that was kinda cute.